HIRING THE RIGHT DJ CAN BE A VERY IMPORTANT & DIFFICULT DECISION. Your DJ will play a critical role in insuring the overall success of your reception and will be a key factor in setting the right atmosphere for your once in a life time event. A common misconception is that that all DJs do the same thing. DJs have their own specialty, style, music & level of professionalism. When looking for a DJ, start by looking for one that specializes in weddings. A DJ that performs for clubs, radios stations, or proms may not be prepared to handle the formalities of a wedding. Experience is essential. Avoid hiring a discount DJ that lacks experience to save money. An experienced wedding DJ will do much more than just play music. Ask the about their experience in weddings, how they insure the success of your reception, & what makes them unique. Get to know their style & approach to make sure it fits what you want for your wedding. Reviews. Any skilled wedding DJ should be able to provide you with list of client references or reviews. A reference list will tell you how frequent the DJ is performing; the type of event the DJ performs for as well the venues the DJ frequents. Be sure to call & verify the references & ask about the DJ’s style & professionalism. Make sure the references are for the actual DJ you are working with not just for the DJ company. Professional Affiliations. The most professional of wedding DJs will belong to wedding, catering & entertainment Trade organizations. This displays the DJs willingness to constantly improve, & network with other wedding professionals. Organizations will have strict code of conduct with high standards in work ethics and professionalism. Always get a contract. The contract should indicate the specific DJ you have chosen along with the agreed performance date, times and fees. Read the contract carefully and understand cancellation policies, payment procedures and all fees. 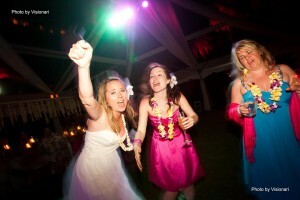 Top Hawaii DJs often get booked from 6 to 18 months in advance, so start looking early in your planning process. It’s your day and you will want it to be fun, refined, and personalized. Make sure you are completely confident and comfortable with the DJ that you hire so you can enjoy a fun and stress free celebration.